You will find it ideally suitable for daily indoor cleaning in middle sized areas of hotels, restaurants, schools, shopping malls and other retail outlets, as well as hospitals, metro/train stations. 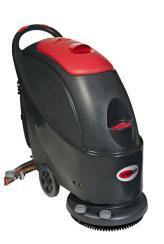 The AS430/510 are a simple to use medium-sized walk-behind scrubber dryers. The perfect solution for scrubbing and drying in mid-sized and heavy-traffic areas. The solution tank and recovery tank is integrated into one molded part which creates higher tank capacity. The body architecture helps to increase tank capacity for longer cleaning operations with one fill. This saves you time! Easy to use. Both the built in charger, reduced pushing force and ergonomic start/stop switch gives the user a better handling of the product and requires less force during cleaning. User-friendly and simple. The cover of recovery tank is much bigger than competitor products and it makes the cleaning of the recovery tank easier. Easy to fill clean water tank, both brush and vacuum motors are very well protected from water splash.